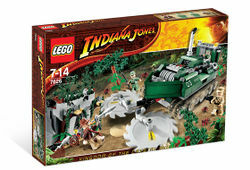 7626 Jungle Cutter was released in 2008 as part of the LEGO Indiana Jones and the Kingdom of the Crystal Skull line. Included are Indiana Jones, Colonel Dovchenko, and two Russian Soldiers. This is a description taken from LEGO.com. Please do not modify it. (visit this item's product page) Beware the spinning blades of the Jungle Cutter! Look out! As Indiana Jones™ is trapped in a makeshift hideout, the mighty Jungle Cutter comes crashing through the trees, chopping down everything in its path with its giant spinning blades. Quick, launch Indy’s rocket and watch the Jungle Cutter explode! Includes Indiana Jones with hat, whip and bag, Colonel Dovchenko™ and 2 Russian Guard™ minifigures, plus ants and break-apart trees! Turn the gear on the hideout to raise and lower the spider web! Push the Jungle Cutter forward to spin the blades! Push the lever on the back of the Jungle Cutter to pop the top pieces off! Jungle Cutter measures 9" (23cm) long, 4" (10cm) wide and has 2½" (6cm) wide blades on the front! Facts about "7626 Jungle Cutter"
Beware the spinning blades of the Jungle Cutter! This page was last edited on 28 April 2016, at 21:02.